As seen numerous times in the indie game scene alone, there is a great desire among us to relive the glory days of gaming’s past. But while most of our nostalgia goggles have been aimed at the 8-bit and 16-bit eras so far, there has been a bit of a desire to move forward into the era of mindless ’90s action games populated by Duke Nukem and his clones. First came the release of Duke Nukem Forever, and we all know how badly that tragedy went, but then Flying Wild Hog was successfully able to revive Shadow Warrior to a lot of acclaim. Last year, however, saw the Postal-inspired Hatred take a savage beating from the critics and then Devil’s Third met a similar fate as it was unceremoniously released without any fanfare. Now, 3D Realms is stepping up to the plate again with the help of Interceptor Entertainment to deliver Bombshell, their latest attempt to bring back those feelings of Surge-fueled nostalgia. And the end result is…well, let’s just say we should be glad that Shadow Warrior 2 is coming, because Bombshell sure as hell isn’t good enough to bring back this trend anytime soon. 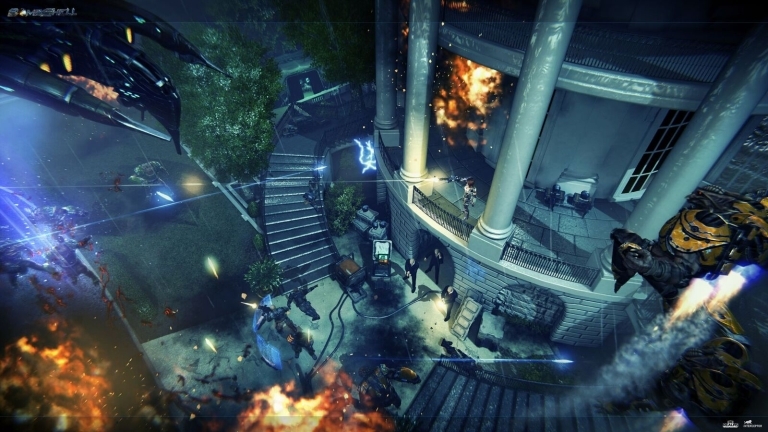 Originally conceived as a vehicle for Duke Nukem, Bombshell is an isometric action game with RPG elements where you play as Shelly “Bombshell” Harrison, a bomb technician turned mercenary whose right arm was replaced with a cybernetic one after it was lost in an event known as “The Washington Incident.” And when the president is kidnapped by the evil Dr. Jadus Heskel and dragged away by aliens to another planet, Bombshell naturally comes in to save the day and rescue the Commander-in-Chief by traveling to various planets in search of her. If you’re wondering what the twist is, keep wondering. While it is a throwback to simpler times, the plot still leaves much to be desired. And after an interesting prologue/tutorial with an alien invasion at the White House (which manages to work a turret section, of all things, into a game like this), things sadly only go downhill from there. 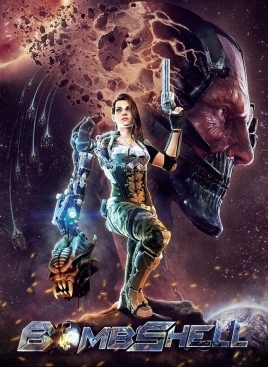 So in order to fight her way through hordes of aliens and rescue the president, Bombshell will have to make use of a wide range of weapons and special skills…is what I would say if you couldn’t stomp through huge chunks of the game using just the default Iron Maiden gun. After all, it never runs out of ammo and is easy to upgrade, so I always found myself saving every other weapon in case something hairier eventually showed up. And yet the game kept throwing ammo at me at every turn, seemingly confident that you will use any other weapon at the drop of a hat despite no real need to do so (though the occasional Bowlingbomb helps). The point here is that challenge and strategy were not exactly high priorities when it came to Bombshell. Between the regenerating armor and the massive amount of medkits you can accumulate (I was packing over forty of them by the halfway point), there’s really no reason to use any other strategy besides just keeping your distance and shooting everything you see. …that would be me, pinned up against the wall by ten enemy guardians as several of them pelt Shelly with ice attacks that prevented me from moving her out of the way. The only way out was to gradually shoot at the constantly advancing mass while they continued to take down my health faster than an hyperactive seven year-old goes through their Halloween candy. And this all took place after a lengthy section that was basically an insulting cake walk, including AI so thick as a brick that I literally defeated at least a dozen enemies simply by standing on an ice floe and watching them all wander off the edge of the land and into the freezing water, drowning them. See, the enemies only really know Leeroy Jenkins tactics, so the only real danger you can ever encounter is being overwhelmed by a barrage of attacks. So the difficulty can swing wildly between pathetically easy and annoyingly unfair, like a lone mosquito suddenly being replaced with a frigging locust swarm. And don’t even get me started on the platforming segments that can kill you instantly if you screw them up (making two games in a row where isometric action games haven’t learned that these bits just don’t work well in them). Perhaps this could have been forgiven if Bombshell had some real personality to it, but neither the game nor the title character succeed in that department either. Not only is the story cliché and played painfully straight, as mentioned earlier, but it has the same annoying tendency as modern-day Simpsons episodes in that it believes pointing out its own flaws is a substitute for humor. Yes, fetch quests are annoying in that they treat Bombshell like a gofer, and yes, it is ludicrous how that one particular character needs saving multiple times. Thanks for pointing that out, game. It would be even nicer if you actually did something about those annoying bits instead of still forcing us to wade through them, but I guess that would require effort. Any other attempts at humor results in the kind of stuff that even Mr. Nukem himself would wince at, including well-worn jokes involving The Legend of Zelda, Resident Evil and Tomb Raider. And the less said about Bombshell’s pitiful attempts at one-liners, the better. Do you find a quip such as “How many aliens does it take to screw in a light bulb? None! Because they’re dead!” to be funny? If so, please have yourself committed so that experts can figure out what’s wrong with you. Actually, even if you did get a chuckle out of that somehow, good luck getting another one to come along after you’ve heard that line for the twentieth freaking time over the course of one gameplay session. There’s an extremely small pool of lines for Shelly to say after she offs an enemy, and they never change. Several hours in, and she’s still delivering the exact same ten or so groaners, despite any changes in enemies, setting, or advancement of any shreds of plot. The end result is a lead character that tries to be a kickass action heroine for a new generation, but instead comes off as generic at best and grating at worst. 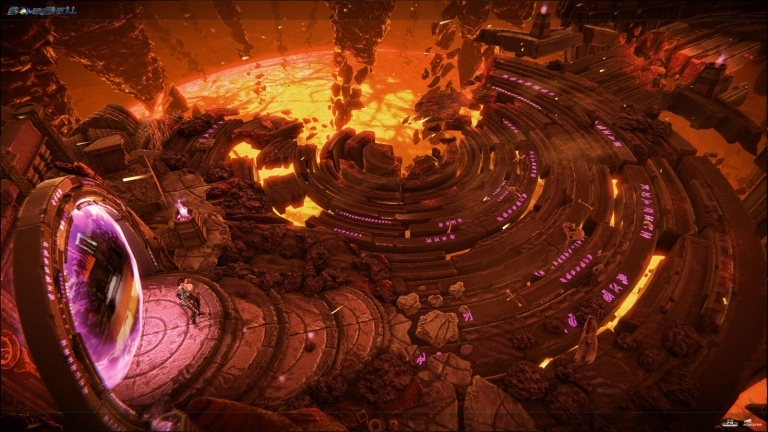 As for the general aesthetics, the graphics do at least look fine, all nice and detailed, it’s just that the environments themselves aren’t really inspired. It’s your random assortment of generic alien backdrops and token video game level templates crossed with heavy metal album covers. You know, the type of over-the-top style every wannabe PC shooter and sci-fi or fantasy game from the late ’90s was going for. And speaking of that era, the music is a direct reminder of those times as well, constantly trying to keep up the aggro rock tone. It all sounds unbearably cheesy after a while, the worst offender being the tune that plays whenever you reach a new level. It’s a short bust of noise, but one so annoyingly loud that it can actually drown out dialogue. So are there any strengths to Bombshell? Well, the controls and the core game mechanics are okay. The arcade-style keyboard-and-mouse setup works fine, and Bombshell easily moves around each area, perfect for an old-school shooter. Purchasing new upgrades and applying skill points is nice and simple, and it does feel like each new upgrade appropriately adds some weight to the attack. Basically, it’s the kind of setup that deserved a much better game. Preferably one without a lot of bugs in it, as I encountered several instances where the game froze up, found myself stuck in place on a seemingly flat surface I had to jump out of, encountered enemy attacks that blatantly missed me but that I still got hit by, and had the game crash upon simply opening the map (which as one final nail in the coffin, is never really helpful at all in figuring out where to go). To put it bluntly, Bombshell is a dud. What once began as something that had potential to become a so-stupid-it’s-awesome classic ended up being merely…well, it isn’t even really that stupid as a whole, just dull. 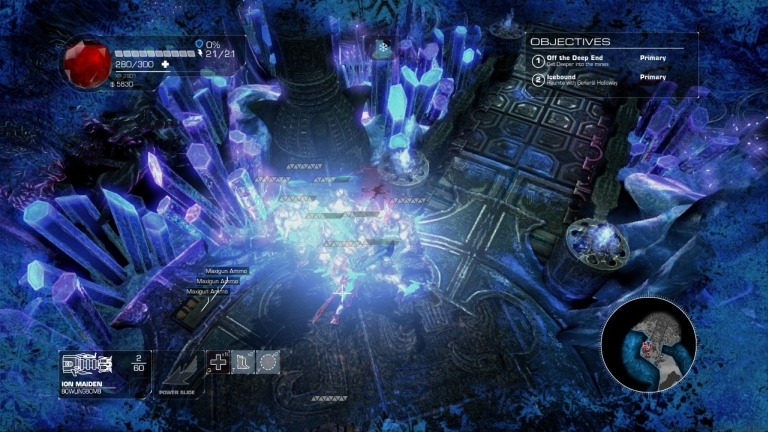 It may have the basics for a decent old-school shooter lurking at its core, but unfortunately all of that is then covered by multiple layers of shoddily-designed gameplay consisting of failures to provide a consistent challenge, tedious enemy encounters, bland story and environments, and severely botched attempts at both humor and attitude. So unless Serious Sam can make a comeback and Lo Wang’s next outing is a darn good one indeed, any future plans for late ’90s action game revivals should be put to bed for the time being.